Offering virtual care would help free up in-clinic appointments for patients who really needed to see a doctor in person, and make care available before and after our normal clinic areas. Some patients would feel more comfortable seeking care for more personal issues or problems that they wouldn't otherwise feel comfortable talking about in person. Our clinics only offered general primary care, and virtual care could open up options for other specialized care and even mental health care. One factor that we predicted led to low virtual care utilization rates is how separate virtual care applications are from other health care workflows. We felt it was essential to integrate virtual care into how our patients normally schedule medical appointments. I worked with our Product Manager to visualize potential virtual care journeys and use cases we should consider. A virtual care journey map to help figure out how and when we should present virtual care to patients. A quick storyboarding exercise to visualize virtual care use cases. 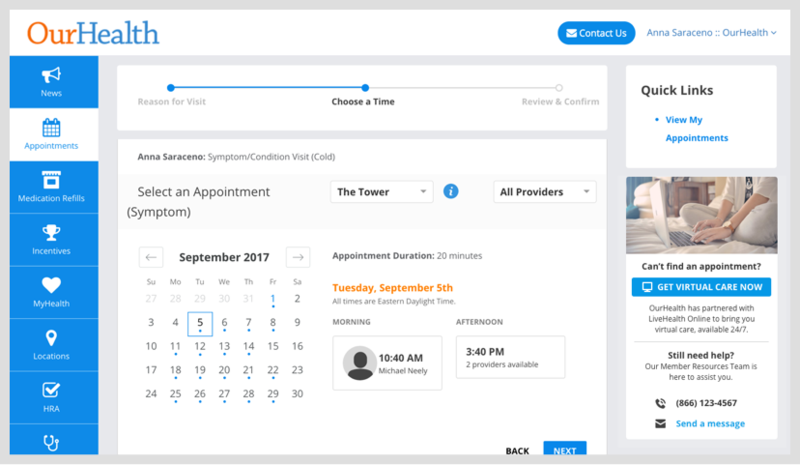 Then we iterated on the placement of virtual care on the appointment scheduler page. We wanted it to be clear and apparent enough to be discoverable, but not get in the way if a patient wanted to schedule an appointment in a clinic.